An explosion caused by Israeli airstrikes is seen from Hamas security building in Gaza City, March 25, 2019. Palestinian officials say Israel and Hamas have agreed to an Egyptian-mediated cease-fire, after a day of fighting in which Palestinians fired a rocket into Israel and Israel retaliated with airstrikes on Gaza. Hamas TV also reported on the cease-fire development, but Israeli officials have not yet commented on the claim. 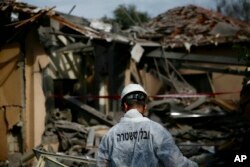 Israeli airstrikes Monday evening hit dozens of targets across the Gaza Strip, including the office of Hamas' leader. Ahead of the airstrikes, Hamas' leadership went into hiding and there is no indication leader Ismail Haniya was in his office at the time of the attack. There were no immediate reports of casualties from the airstrikes, which came as retaliation to a Hamas rocket attack that hit a house in central Israel, injuring seven people. Israeli Prime Minister Benjamin Netanyahu was visiting Washington at the time of the Hamas attack. He said during a meeting with U.S. President Donald Trump, "Israel will not tolerate this. I will not tolerate this." He said Israel "will do whatever we must do to defend our people and defend our state." The rocket attack was the second launched toward central Israel in recent weeks, and prompted Netanyahu to cut short his trip to Washington. FILE - U.N. Secretary-General Antonio Guterres delivers a speech in Geneva, Feb. 25, 2019. 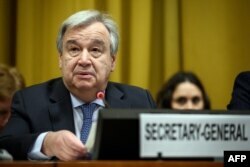 U.N. Secretary-General Antonio Guterres said Monday he was "gravely concerned by the latest developments" in the Gaza Strip. He called the Hamas rocket attack "a serious and unacceptable violation" and urged all sides "to exercise maximum restraint." The violence has raised fears of the possibility of a larger conflict just two weeks before elections in Israel. Margaret Besheer at the United Nations contributed to this report.